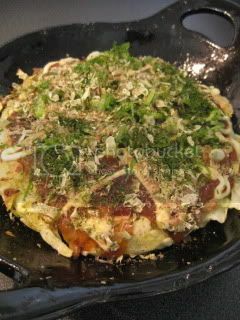 With my small-size Iga-yaki donabe, I can make quick and delicious meal for one. 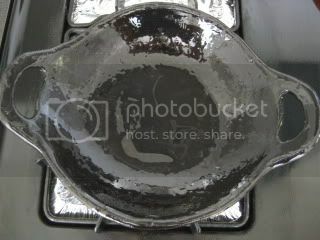 The other day, I was craving for Okonomi-yaki (Japanese savory pancake), so I made it with Iga-yaki Toban (donabe skillet). Because this toban is made of 100% Iga-clay, once it's heated, the toban gives the intense steady heat and cooks the ingredients so nicely. First, I heated some olive oil in the toban over medium-high heat. Once it was hot, I turned down the heat to medium-low. 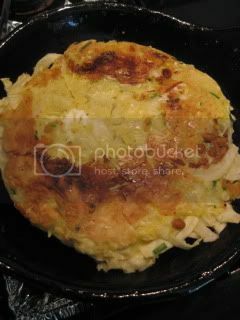 I poured the batter (mixture of flour, water, egg, kombu powder, mountain yam, cabbage, dry baby shrimp, scallion) and covered the surface with a package of natto (fermented soybean). After 4-5 minutes, it was turned over and cooked for 3-4 more minutes. 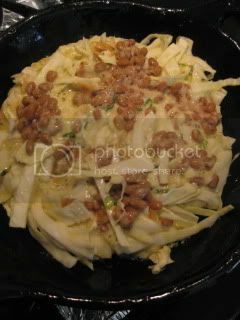 My quick Natto Okonomi-yaki was ready. I decorated it with some "okonomi" sauce, mayo, sliced scallion, bonito flakes, and ao-nori flakes. 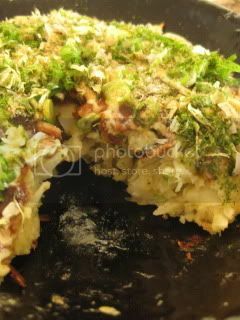 Because it was cooked in Iga-yaki toban, the texture was nicely fluffy, and Okonomi-yaki remained to be hot for a long while. It was just delicious!